Located on one of the busiest intersections in Hawthorn, resides Muharam; a cute and cozy little cafe that could possibly go unnoticed if it wasn't for it's signature white picket fence. We certainly couldn't go past it. Not after stumbling across images upon images of it's fluffy, thick, sugar dusted red velvet pancakes on the internet. No siree. Not JoJo and LiLi. LiLi wasn't keen on another early Saturday morning. She'd typically have a bit of a sleep in, but the outer rumblings of city construction and cat meows would eventually crush those dreams (literally), waking her from her slumber at 8:00am. #FirstWorldProblems. "What to wear?" 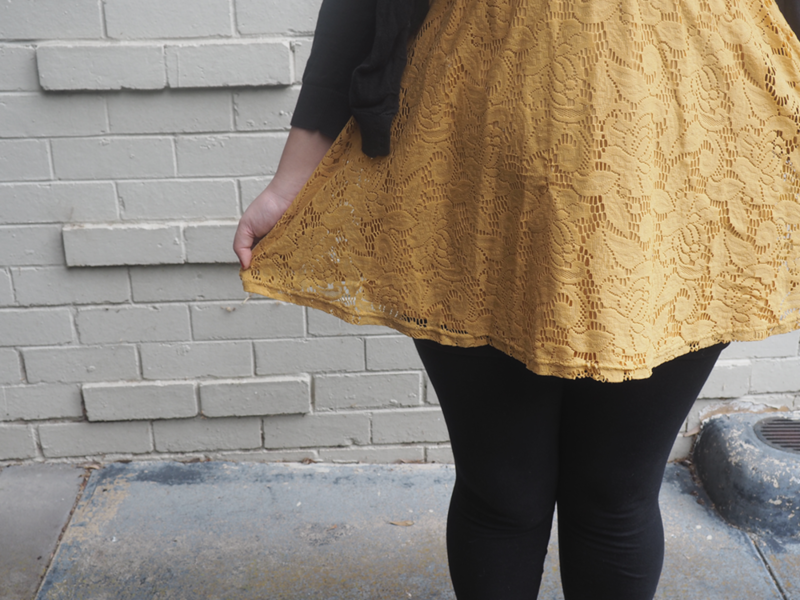 she thought shortly before settling on a mustard lace top, leggings and leopard shoes. She fixed her make up and hair, shot a final, satisfied glance in the mirror and then set off for the 70 tram ride to Jo's. Jo wanted to punch LiLi in the face after about the 5th buzz of her door bell. She tore open the front door to find a gleeful little Li, happily tapping away at the buzzer, and ushered her inside before she woke up the entire apartment complex. Inside, Jo threw together her go-to lazy girl outfit: basics and a couple of statement pieces. She wasn't interested in delaying brunch any more than she had to, so enter Zara, Windsor Smith and Olivia Burton to save the day. Grumpy Mate Rich wanted to get in with his own glamor shot too and couldn't see any reason why he couldn't have his own full body shot with the girls. Well, you make the blog Rich. Go you. With all the excitement of that morning out of the way, we finally hopped in the car and left for Murham. ...which happened to be pumping. There were already two other groups waiting outside what appeared to be a tiny little hole in the wall. Our prospects didn't look all that great so we decided to send in a delegation (LiLi) to see what the deal was. The friendly male host advised of a 25 minute wait - okay, not too bad. With the thought of a delicious breakfast soon to come, the group decided to patiently wait it out. Have a picture of Jo giving LiLi some serious shade. The Hanger was real. We were finally led inside after about a 30 minute wait and realised that the café was deceptively smaller from the outside. Seated on a small wooden table that comfortably sat one, pushed it for two and appeared a seemingly impossible fit for three; we were curtly handed some crumpled paper menus and water without so much as a 'hello' from the waitress. The girls decided that they were quite set on the Red velvet pancakes and milkshakes. Who didn't want to have a sugar overload for the first meal of the day? Clearly these were the right decisions to be making at this stage of their lives. A much friendlier waitress came by and asked how we were doing with the menus and if we wanted to start off with any beverages. We needed a bit more time to review the huge breakfast items and so accepted her offer. We of course, went with our signature mocha and soy chai. Our mochas were well textured and not too sweet - a really good way to start and LiLi's soy chai was the absolute bees knees. Our smoothies came out in no time at all and man, where they a meal onto themselves. Jo had the sneaking suspicion that she had made a huge mistake - one sip of her Mango Sunset Smoothie had her reeling from the tangy sweetness from the apple and mango juices, and she had a feeling that there would be plenty more that sweetness in her pancakes. LiLi's smoothie was a great green breakfast concoction. No flavour stood out over the other and it was perfectly balanced for a good morning kick. Although she chose to go with a sweet breakfast, this smoothie would have worked better with a savoury meal; possibly a more healthier meal. We only had a couple of moments with our smoothies before this hit our table - the service was really quite quick. Rich expressed his love for his breakfast - a feast of mammoth proportions. Everyone loves bacon and this didn't fare any differently. The mushrooms were done particularly well and the egg was really quite silky - not hard at all. He wasn't expecting the avocado so that was a nice touch that worked well overall. Close up, in focus bacon is best bacon. House made crumpets - what a sensational and well balanced dish! With one look, you might think "Oh my! How will I tackle this?". Your first thoughts will be filled of the future regret. Be pleasantly surprised at how easy this goes down. The crumpets were not heavy as they looked. They were crisp, bouncy and delicate to taste. Everything on the plate works in unison. With the added bonus crunch of the peanut praline mixed with light mascarpone, it tied the salted caramel sauce perfectly to the crumpet. Jo had a sneaky bite and fell in love too! Let's move onto what drew the girls into Muharam in the first place: the red velvet pancakes. When this arrived, JoJo thought that it looked like Christmas on a plate. These were devilishly good - the pancakes were light and airy and the hit of the cream cheese frosting gave it that wow factor although it's arguable that you didn't need all of that cream cheese frosting or all of that chocolate sauce. The berries added a bit of freshness to the palate - something you tend to appreciate when you have that much refined sugar! What attracted to me was the red velvet pancakes. The sweets over savoury. It's funny because I didn't end up eating the pancakes and went with the home made crumpet. It's a popular place come Saturday lunch time. An approx 25 minute wait, and we were in. It's a cramped space, though I liked the decor of wooden slate bench, potted plants and bicycle wheels on the walls as well as the wooden branch feature behind the counter. Had a real rustic feel. I had no space to move where we were seated so if you don't like a tight fit, be weary. I thought the home made crumpets hit the spot. The salted caramel sauce was not overpowering and was balanced with the peanut praline and bananas. It was visually appetising. When trying JoJo's red velvet pancakes, I felt the cream cheese frosting was too sweet and the thought to eat 3 pancakes with chocolate sauce was over bearing. I would have got sick of it fast. A trend currently sweeping Australia are the freak milkshakes with an added bonus of donuts or other sweet stacked toppings. I was excited to try this but what put me off was watching it being made, and then the leftovers being left in the blender near the window. This meant when a new customer ordered, they'd add to the existing mix. Ahhhh, what if the milk goes bad whilst waiting for the next order? - Ok, it's probably not likely but would they check how long it'd been sitting there before making the next batch? Why weren't they making enough mix for just the outstanding orders? Just didn't sit well with me because of the general stomach problems I have, and leaving food out that typically should be refrigerated, will actually destroy my stomach. My soy chai however was perfect and go go green smoothie was an added neutral touch to my overall sweetness overload. I had read reviews that the customer service was lacking. I threw caution to the wind and gave them the benefit of the doubt. If it wasn't for the male host and one other female worker (who held it together when it was super busy), I wouldn't commend the staff for service. Go there for the food... Make up your own mind on the hospitality and if you should order a milkshake, make sure it's a fresh batch. These pancakes were the death of me but as punishing as they were, I would go back for more... in about ten months time when I finally recover from that onslaught of sugar. I love cream cheese frosting but felt like much less could have been dolloped onto the pancakes. I also felt that the jar of chocolate sauce wasn't necessary either. Admittedly, I made a huge mistake with the smoothie. It definitely would have been much more refreshing if they had cut down drastically on the sugar and, if it was the only thing I had that day - it was huge! I ended up having to leave almost all of it behind when we left the table because I was completely destroyed by those pancakes. LiLi's crumpets were amazing and I loved the caramelised bananas. Grumpy Mate Rich's mountain of food looked great too and - everything was quite well presented and it was quite clear that the staff in the kitchen had a lot of passion and pride to show their patrons. That being said, it's a shame that that didn't trickle down to the wait staff - I did feel that the customer service was a bit of a let down. The table next to us asked for Nutella milkshakes and instead of saying "I'm so terribly sorry, we've just run out of doughnuts, we can make them for you without them though? ", the couple next to us got a very curt "we don't have any doughnuts" and they ended up having to ask if they could forgo the doughnuts. It's a cozy little retreat inside with some thoughtful touches made to the decor and wall installations. I was particular taken by the white washed walls contrasted by the exposed brick work and branch hangings above the counter - very rustic. Muharam was dominated by a large female patronage that day who were there in droves for the brunch/lunch service. A jovial overall atmosphere if you forget the inconsistent customer service. One final word of warning: don't expect to get much done after a breakfast like that. Have a nanna nap. Go ahead, I won't tell anyone.